Ever heard the saying that goes something like “a fix that is looking for a problem”? This app is just that. It is fixes a problem that unless you have come across it yet, you don’t know you have the problem. But, the day you stumple upon it, you will either have to live with the issue or go searching for a solution. The problem, when you get a email or grab a download that is compressed. Which can be in a variety of ways; zip, rar, 7-zip, tar, gzip, bz2/BZip2, LhA and StuffIt. You are stuck with a file that has what you want/need but it is all wrapped up and the iPad doesn’t know what to do with it. Not a problem if all you do is grab your own files since you know not to archive a bunch of items into one. But, as you expand your reach like we have done, suddenly folks are naturally sending/sharing files the best way they can. Compressing makes great sense to bundle multiple files together so people have everything they need, it also ‘generally’ makes the sum of the files smaller in size for easy of distribution. Once on the iPad, the fun of sharing stops. Seriously bad news if your in a meeting and you reach out to get a file being discussed and then can not run the last mile to viewing it. In a room full of PC, they all get a chuckle at the iPad user… they were jealous, just blowing off steam. This was a long way around to telling you about the solution we stumbled on, iUnarchive. An app for the iPad that sees your compressed files and allows you access to the files within. Once iUnarchive ‘opens’ the file, you can view those files within iUnarchive or share them out individually to other apps on your iPad. You can ‘open with…’ any of the files like you do with email attachements. 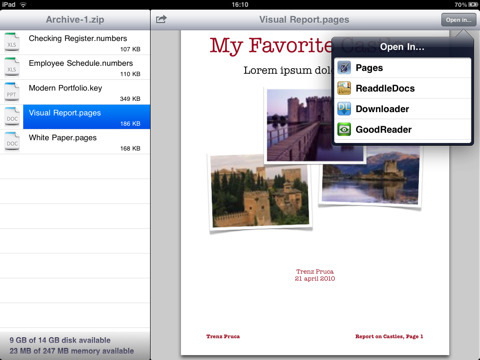 Look inside of a zip and find a powerpoint or doc that you open in Documents To Go or Pages and Keynote. Like we said, we didn’t know we even needed this till we were in the thick of the problem, hope we helped you get a solution ahead of it. This is a universal app, so buy once and use on your iPad and iPhone… got a iPhone 4 yet?